Elaine Tyler May Discusses New Book 'Fortress America' And Fear In America Historian Elaine Tyler May says that since the Cold War, fear has crept into American life. Her new book, Fortress America, examines key events that shaped today's political climate. Historian Elaine Tyler May says that ever since the Cold War, fear has crept into American life and created apathy toward democracy. During that time, the government and media gave Americans constant warning about nuclear war and communism — adults were encouraged to build shelters, children practiced hiding under their desks to prepare for a possible nuclear attack. "Basically, the message was the bomb could drop at any time," she says. "Each person was responsible for their own safety. There's really nothing the government or the leaders of the country can do to protect you." It's during this period where May begins in her new book examining how fear among Americans has been on the rise for decades. 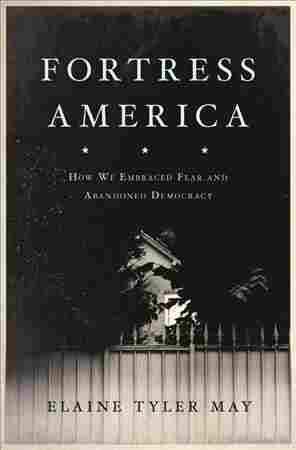 At the heart of her book, Fortress America: How We Embraced Fear and Abandoned Democracy, she examines if we've ever really been in the kind of danger our leaders spent 50 years telling us we were in. Guest host Ray Suarez spoke with May on All Things Considered about the historical events that contribute to how we think about danger today, and how that affects national dialogue about law enforcement and violent crime. As our leaders and our media have focused overwhelmingly on issues of danger to personal safety, it has had a tremendous impact, to the point where even as those dangers statistically declined, fear of those dangers increased. So in the 1960s and '70s as you have more and more people of color and more and more women entering the public arena, there was a lot of reaction to that. There was a lot of backlash, as well. And that backlash took the form of inciting fear that women were really at risk of being attacked if they went into the public arena. And women were warned over and over again that they should go home to be safe — they shouldn't be out at night, they shouldn't be on the streets alone. There was a very, very loud and increasingly exaggerated attention to crime and particularly a focus on the notion that black men, particularly young black men, were dangerous. Now what we know statistically, the individuals who were most likely to be victims of crime were black men. Those who are least likely to be victims of violent crime were white women. And yet the way that the media and a lot of political leaders framed it, it was just the opposite. It has really affected our political life. It has affected our personal lives, and really since the late 1960s, American politicians, American leaders, have used the fear of crime to call for law and order kinds of policies, to encourage Americans to be afraid of their neighbors, of people they don't know. And that has really caused a sense of retreating of the common good. It's created distrust where we know those fears are highly exaggerated and completely out of touch of the reality of the situation. Editor's Note: Elaine Tyler May's son is Michael May, senior producer for NPR's Story Lab. The NPR producer who booked May to appear on the program did not know of their relationship in advance.